In the previous article we discussed inversions within the frame of enharmonic modulations. I will take this opportunity to explore with you in this and the following article the different ways in which you can take advantage of these inversions. But to that end we need to first deal with the concept of "motion." As we've seen before, chords are basically a combination of notes played simultaneously. But you could also consider every note to represent a distinct voice and that the succession of several chords marks, at the same time, the individual progression of each of those voices. In articles 11, 12 and 13 of this series, we saw the rules that define chord progressions and the "attraction" between them. However, the rules I told you about back then did not consider the individual progression of each "voice" through the different chords. These progressions are called "motion." And they can be "melodic" when they involve only one voice or "contrapuntal" when they involve several notes. This type of movements have two features: direction (ascending or descending) and nature (conjunct or disjunct). I think it must be clear enough for anybody that the direction of the motion determines whether it moves upwards or downwards in terms of pitch. 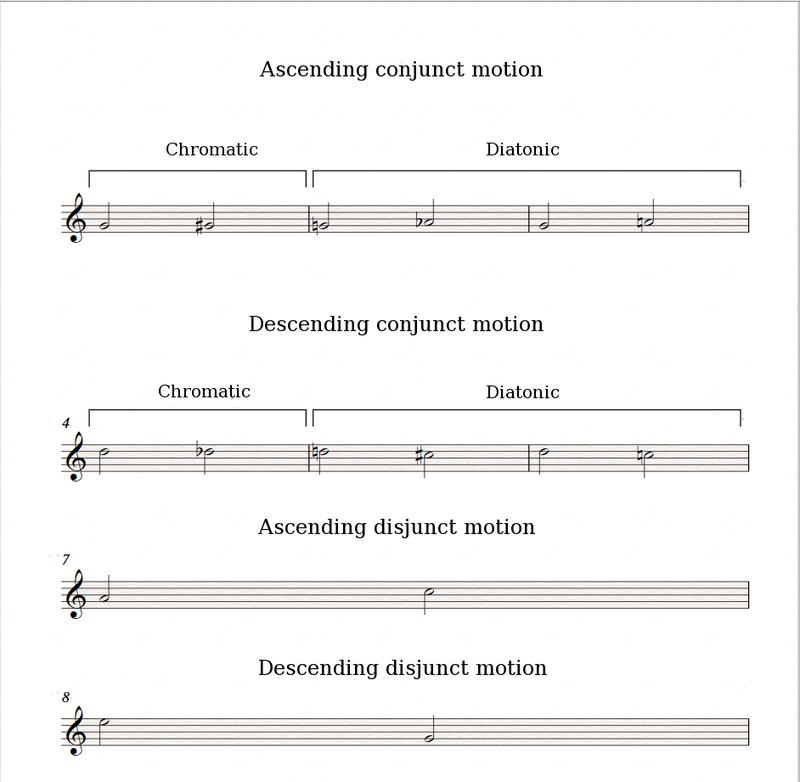 As for the nature of the motion, "conjunct" and "disjunct" refer to the interval between two consecutive notes. If the interval is smaller than a major second, the movement is conjunct. Otherwise it's disjunct. 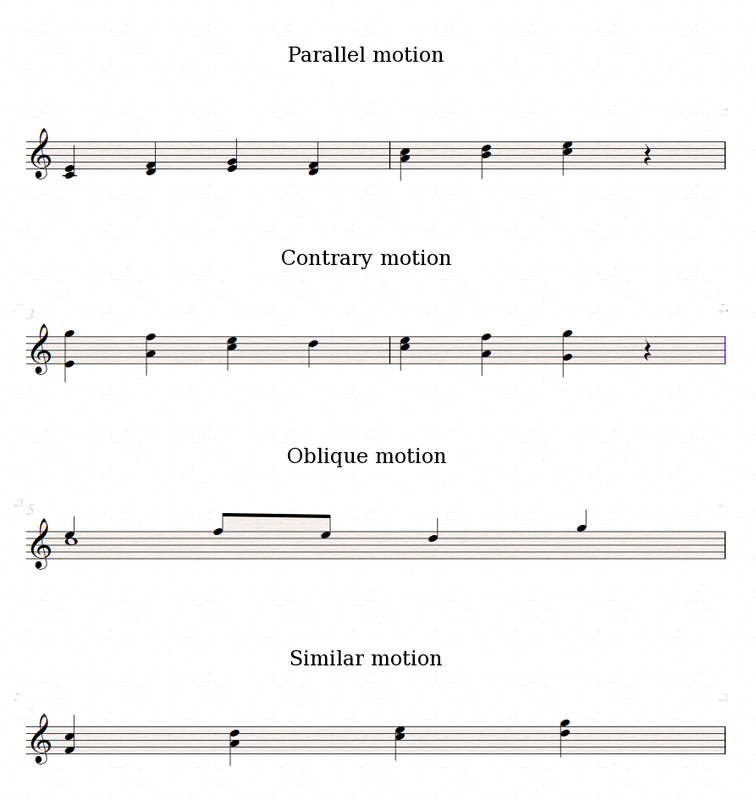 There are four types of contrapuntal motion: parallel, contrary, oblique, and similar (sometimes considered oblique by some authors). These terms might seem a bit abstruse, but don't worry, you'll soon realize that they refer to very simple realities that you have surely seen before. Parallel motion implies a progression where the interval between voices remains the same, in other words, the second voice faithfully follows the first voice. 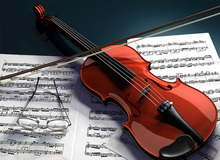 You will obviously have to adapt the intervals in question so as not to involuntarily leave the current key, like in the example where we have major and minor thirds. Classic harmonization theories banned fifth and octave progressions for various reasons I'll address in a future article, favoring thirds and sixths (major or minor). Nevertheless, in contemporary music, progressions of fifths and octaves are common practice (think of powerchords in rock, for instance). Contrary motion implies that the two voices take opposite directions in relation to each other. When both voices cross paths, it's called a voice exchange. Oblique motion happens when the pitch of one of the voices remains static while the other evolves. Finally, similar motion is when the two voices evolve in the same direction but the intervals between them vary. All this paves the way for the study of counterpoint, which we will begin later on. In the upcoming articles we'll see how to make the best of these "motions" to harmonize a melody, pull off a nice bass line, etc.